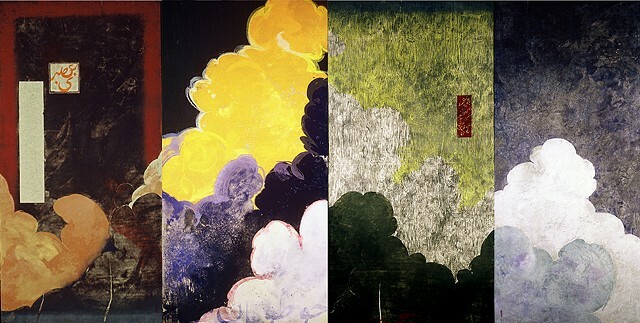 Four Large scale Japanese woodcut relief prints on rice paper, designed as a quadriptych. Each panel was designed as an independent print offering a line or a shape as point of entry into the next panel. Monotype process was combined with multi panel relief print to produce a variety of unique prints based on a single underlying design. The image of a cloud is used as a symbol of autonomy, change, and crossing boundaries. The combined Japanese and Persian visual aesthetics express personal connotations and an attempt to create a visual space for coexistence.